Connect with your target market wherever they are with a mobile app. From business, communication, to social and entertainment, our mobile app solutions put you acquainted with your consumers. 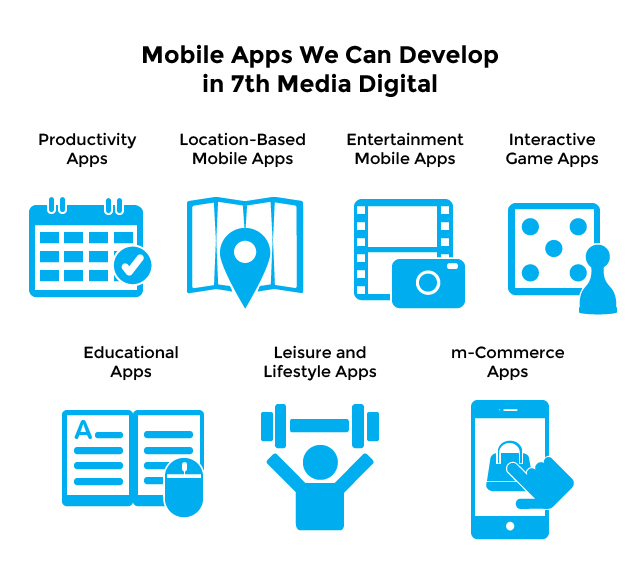 7th Media Digital Studios is a mobile app development company in the Philippines and we provide you with ways to mobilize your brand’s information, transactions, and advertisements with custom mobile applications. Take a smart move in your business and extend your brand’s reach to mobile consumers. We provide mobile app development services for both Android and Apple devices using advanced developer tools like Eclipse and Android Studio for Android, and Xcode for iOS. Our mobile app developers can develop catalog apps, productivity apps, e-commerce apps, interactive game apps and more. A valuable and user-friendly mobile app for Android or iOS that can be easily accessed “real-time” by your consumers whenever they need it. A clean and clear design aesthetics to ensure that your mobile app will provide a great user experience to your customers. A team composed of mobile app developers, user interface designers and usability experts that will work closely with you to make your mobile app on par with the leading and more popular apps available in the market today. A support and maintenance solution on the duration of your contract with us to assure that your mobile app remains operational despite mobile software updates. Today, mobile is the new face of consumer engagement. No matter what type of business you have and if your business is available on mobile, your business will absolutely thrive with a higher market reach. Get the right mobile application for your business. We develop native apps, mobile web apps and hybrid apps. Native Apps are mobile apps specifically built for a particular mobile operating system like Apple’s iOS or Google’s Android. These are mobile apps which you can download from the App Store or Google Play, install on your mobile device and run by tapping the app’s icon. The main advantage of Native App is its fast performance and high degree of reliability. Since Native Apps work with the device’s built-in features, they typically perform well and are faster. Native Apps are normally used for mobile app solutions which require offline data management in the mobile device. Users can use some Native Apps without an active internet connection, making Native Apps the ideal apps for mobile solutions that need to function without an internet. 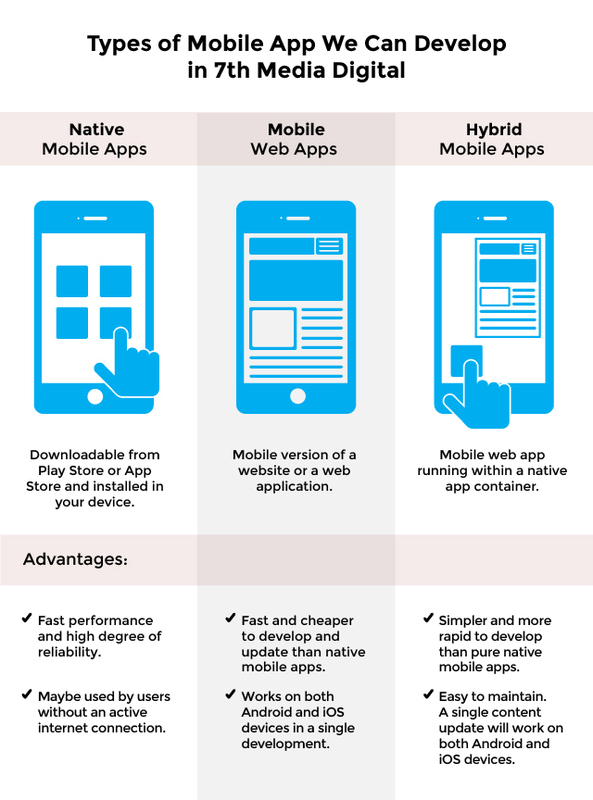 Mobile Web Apps are basically a “mobile version” of a website or a web application. It has the same elements of your regular website or your web app – look and feel, pages, content, navigation, etc., but it features a mobile-friendly layout that offers improved readability, and functionality when viewed on a mobile device. These apps are cross-platform mobile applications that run on the device’s web browser. Mobile Web Apps allow users “anytime-anywhere” access using an mobile operating system or any mobile device, without compromising user experience. Mobile Web Apps are faster and cheaper to develop than native mobile apps since there will be no need to develop separate apps for Android and iOS. The beauty of Hybrid App is that it combines the benefits of Native and Mobile Web App in a single application, giving your app the ability to be discovered and distributed in Android and iOS stores while you get a full-screen web view of the content inside your app which can be easily be updated and controlled. Unsure which type of mobile app is right for your business? Contact us and we’ll help advise the right mobile app solution for you. Here are some samples of mobile apps which we can develop for you. Organize day-to-day activities with productivity apps. Such apps include calendar, memo pads, alarm clocks, reminders, planners, storage, etc. Being armed with extra mobile utilities such as calculators, converters or planners will definitely keep your users in sync with their to-do list and boost work efficiency. Let location-based apps lead the way for your consumers. Location-based information services are digital distribution of information based on device location, time specificity and user behavior. Location-based apps can be used for maps, navigation, traffic, weather, tracking, geo-tagging, or emergency. Searching for various locations, tagging customer address for deliveries and getting traffic information can become easier and convenient with location-based apps. These guides provide you with directions and sometimes with voice or non-voice navigation. Stream videos, listen to music and capture images. There are numerous apps that are devoted to capturing, editing, and viewing images, playing and downloading audio and video files, and storing and sharing these apps on social media networks. Entertainment apps are the most downloaded apps by mobile users. Get interactive game apps for business. Support your digital marketing campaigns with interactive game apps such as board games, card games, puzzle games or adventure games and get a stronger brand recall with higher user engagement. These types of apps keep users of all ages get strongly acquainted with your brand. Make learning fun with educational apps. With more students using tablets and mobile devices to study, there is currently a growing demand for educational apps. These apps include ebooks, library, drawing, audio books, dictionary, language arts, quiz games, and everything that is incorporated with learning. Keep your users of all ages improve their ability to think, connect, and use information with custom educational apps. Give a daily dose of lifestyle tips to your users with leisure and lifestyle apps. We develop apps that will interests your audience ranging from sports apps, cookbook apps, fashion tips, how-to guides, fitness manuals, wellness apps, to meditation apps. Sell to your customers “anytime-anywhere” with m-Commerce Apps. Mobile e-Commerce brings the marketplace closer to the consumers – with your own stores in their mobile devices. You will be able to process data orders fast, market your products and services easily and interact with your consumers. m-Commerce apps can be accessed by anyone with an internet and these apps are easy to use and functionally rich. Are you looking for a mobile app developer or a Philippine company that provides mobile app development services? If you want to maximize the use of mobile technology to suit your business objectives and the needs of your consumers, our mobile app development company in the Philippines can help you develop and customize your mobile app. Contact us and let’s start your mobile app development project.